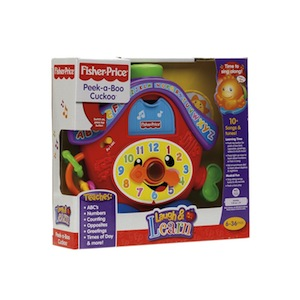 A friendly light-up birdie pops out with a greeting, and lots of songs and activities keep baby busy! Press the light-up nose for a counting song, spin the dial to learn about night and day, turn the key, slide the beads, spin the clock hands-and pass the time with plenty of learning fun! Plays 10+ songs and tunes, with fun sounds, phrases and volume control for quiet play. Requires 2 AA batteries. Teaches: ABC's, Numbers, Counting, Opposites, Greetings, Times of day and more! 6-36 months.